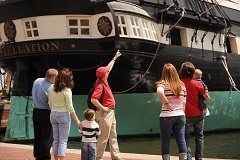 Discover Baltimore – Hear stories of America’s Charmed City – exploring landmarks associated with the War of 1812 as our nation defended itself; the Civil War which tore apart our City and the nation; learn about industry and commerce in a port city and the struggles and triumphs of the diverse peoples of America. The Heritage Walk, the city's oldest urban trail leads visitors through three distinct areas of Baltimore: the Inner Harbor, Little Italy, and historic Jonestown. The route passes by the USS Constellation, Star-Spangled Banner Flag House, Reginald F. Lewis Museum of Maryland African American History and Culture, the Carroll Mansion, and the Jewish Museum of Maryland. The tour departs promptly from the Baltimore Visitor Center, 401 Light Street, at the intersection of Conway Street, at Baltimore Inner Harbor West Shore.